How much are mobile business apps going to cost you? Here’s a compendium of analyses, surveys and calculators to help set reasonable expectations for what building a custom mobile business app will cost. A VDC survey of enterprise app developers found mobile apps to cost an average of $140,000 each. A Clutch survey of app development companies indicated a median price of $171,450 per app. A Kinvey survey of CIOs found the average price to be $270,000 per app. Cost calculators provided by various companies show a feature-rich app might cost from $267,000 to $360,000. An EMM survey showed over 75% of enterprises budgeting over $250,000 for mobility solutions, with over 25% budgeting over $1.5 million. An Outsystems survey of 3,200 IT professionals found 62% reporting a large app development backlog, and 37% facing a shortage of mobile app developers. Nearly half report dissatisfaction with apps taking too long to develop: Over 80% of mobile apps take over three months to develop, and 40% of apps taking longer than 6 months. In a 2017 executive brief, VDC reported findings from a survey of application developers. On average organizations require more than 6 months to develop and deploy a single mobile application, and spend an average of $140,000. VDC also found that 36% of organizations were dissatisfied with the speed at which their business was adopting mobile applications. 56 percent of mobile leaders surveyed say it takes from 7 months to more than one year to build one app. 18 percent say they spend from $500,000 to over $1,000,000 per app, with an average of $270,000 per app. The Enterprise Mobility Exchange surveyed 300 senior mobile practitioners around the world and published ‘The Global State of Enterprise Mobility: 2016’. One finding of the survey was that the most common budget size for the next 12-18 months was $250,000–$500,000 chosen by 29.1 per cent of respondents — followed by 25.3% who answered over $1.5 million. In a June 2016 report, Magic Quadrant for Mobile App Development Platforms, Gartner analyzed 17 vendors in its MADP category: Adobe, Appcelerator, Appian, Backbase, DSI, Embarcadero, IBM, Kony, Mendix, Microsoft, Oracle, OutSystems, Pegasystems, Progress, Red Hat, Salesforce, and SAP. Even among the ‘low-cost’ options, Gartner notes that actual costs may be significantly higher depending on other related services purchased from these vendors. The full Gartner report can be found here (registration required). Several mobile app and platform companies are now offering calculators that let you specify the features you need and see a ballpark estimate of how much your app will cost. We ran a hypothetical app project through each calculator, answering the questions to represent the kinds of features and complexity we see in our own customers’ high-end mobile solution requirements. Our example project is for iOS and Android and includes login authentication, complex business logic and UI, offline functionality, and backend connections. Keeping the estimates parallel was an inexact science because they each ask different questions, but we made the effort. Below are the results. This Kinvey estimate was for the price of building the apps yourself. To be fair, Kinvey also calculated the lower cost of $139,000 to build the app using their own BaaS platform. It would be a mistake to think of app design and development as a one-time cost. Creating the app may just be the tip of the iceberg, or better yet, the first step of a long journey. A Forrester Survey once found that the average amount spent on a typical mobile app ($50,000 to $150,000) turns out to be just 35% of the true two-year cost. Commentum in 2015 estimated the maintenance cost for a medium-sized enterprise application project to be in the range of $5,000 to $11,000 per month. Even the lowest estimate for a small project is not insubstantial at $3,000 per month — and a larger project ranges as high as $25,000 per month. Not enough skilled mobile developers. Gartner predicts, “through 2017, the market demand for mobile app development services will grow at least five times faster than internal IT organization capacity to deliver them. *” There simply aren’t enough skilled developers to keep up with demand for business app scenarios. Average Cost of Developing a Mobile App Now over $200,000 (DMI, 2016) Lays out 7 stages of app development and analyzes the level of effort ranges for each phase. How Much Does It Cost to Build a Mobile App? 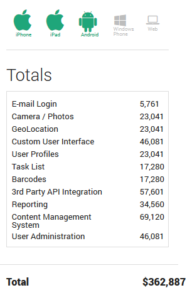 (Buildfire) Cites several of the same data sources as we present here, and provides analysis with a focus on B2C apps. iPad App Development Cost – A Breakdown (Propelics) Dated but still useful analysis of consumer vs. business apps and what features make an enterprise app expensive ($150,000 and up). Sorry you are having issues. Perhaps try a different browser. We have had no one else report this issue.